+Gliere: Symphonie Nr. 3 "Ilya Murometz"
+Ferenc Fricsay probt Smetanas "Die Moldau"
Die schönsten Geschenke machen uns Plattenlabel zu Geburtstagen von Komponisten und Musikern. Im August 2014 jährt sich der 100. Geburtstag von Ferenc Fricsay, dem großen und großartigen Dirigenten, der 1963 viel zu früh verstarb. Kaum ein anderer Dirigent des 20. Jahrhunderts war so perfekt auf einen Werdegang als Maestro vorbereitet. 1914 wurde Ferenc Fricsay in Budapest geboren. Als Sechsjähriger schrieb ihn sein Vater Richard, ein Militärkapellmeister, an der Liszt-Akademie ein. Ferencs musikalisches Talent förderten die Eltern, indem sie ihn nicht nur Klavier, sondern auch Violine, Klarinette, Posaune, Pauken und andere Schlaginstrumente lernen ließen. Am Ende seiner musikalischen Ausbildung beherrschte Ferenc Fricsay fast alle Instrumente eines Symphonieorchesters bis auf die Harfe. Somit war er prädestiniert, Dirigent zu werden, und zwar ein Maestro, der das Potenzial jeder Instrumentengruppe aus der Sicht eines Instrumentalisten heraus zutiefst verstand. Dieser Umstand machte ihn zu einem hervorragenden Probendirigenten, der streng, fordernd und akribisch den Klang jedes seiner Orchester weiterentwickelte. Aufführungen und Einspielungen des Dirigenten Ferenc Fricsay, der präzise arbeitete und große Präzision von seinen Orchestern erwartete, empfanden Kritiker in Fricsays jungen Jahren zunächst als zu analytisch und wenig emotional. Obwohl ein kraftvoller, energischer und vitaler Dirigent, wurde sein Stil als unterkühlt empfunden. Diese Einschätzung der Musikkritik verlor sich in späteren Jahren. Glücklicherweise hat mit der nun erschienenen Geburtstagsedition aus der Serie »Ferenc Fricsay – Complete Recordings on Deutsche Grammophon« jeder Hörer die Möglichkeit, sich ein eigenes Bild dieses großen Dirigenten und seiner Entwicklung zu machen. So vielseitig wie die Ausbildung von Ferenc Fricsay gestaltet sich auch das Repertoire seiner Einspielungen, das auf den CDs »Complete Recordings on Deutsche Grammophon: Orchestral Works« dokumentiert ist. Seine Interpretationen der Werke von Bela Bartók und Zoltán Kodály gelten bis heute als Referenzaufnahmen. Die Werke moderner Komponisten wie Boris Blacher, Werner Egk, Reinhold Glière, Paul Hindemith, Arthur Honegger und Frank Martin waren im präzisen Dirigierstil Ferenc Fricsays ebenfalls gut aufgehoben. Legendär sind zudem die Einspielungen der bedeutenden Symphonien von Haydn, Mozart, Beethoven, Schubert und Tschaikowsky sowie der Mozart-Klavierkonzerte mit der großen Clara Haskil. Werke von Max Bruch, Johannes Brahms, Bedrich Smetana, Antonín Dvořák, Serge Prokofieff, Igor Strawinksy, Claude Debussy und vielen weiteren runden die umfangreiche Sammlung der von Ferenc Fricsay eingespielten Orchesterwerke ab. Wenn Sie Ferenc Fricsay noch nicht kennen, bietet sich mit den 45 Tonträgern der »Complete Recordings« eine unvergleichliche Möglichkeit, ihn posthum schätzen zu lernen. Die Fricsay-Kenner wissen ohnehin, dass seine Aufnahmen eine Bereicherung für jeden Musikliebhaber sind. That teenager was myself. And if my choices now look rather unadventurous, I must explain that I had been almost exclusively hooked on opera since the age of seven and had been amassing historic vocal 78rpm discs since discovering Enrico Caruso at 11. But I had begun going to SABC Symphony Orchestra concerts and, with my mother, had essayed a few chamber recitals. I had no idea that, in my ham-fisted way, I had started at the top. 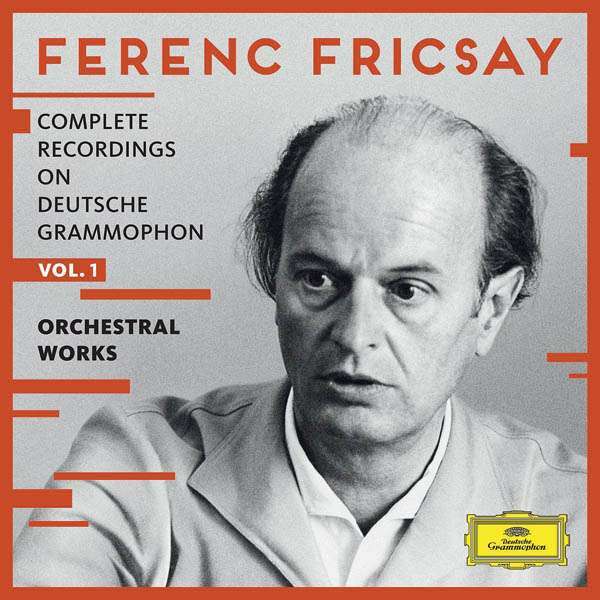 I knew nothing of Ferenc Fricsay, although I registered that the Rimsky-Korsakov was played by the Radio Symphony Orchestra of Berlin, while the other two discs featured the Berlin Philharmonic. The Dvořák was a new release which had only just arrived in the South African shops. The performances seemed then, and still seem, absolutely stunning. And, with more than half a century’s experience of listening since those far-off days, I have some understanding of why they were so exceptional. As we mark Ferenc Fricsay’s centenary, even a brief consideration of his early life will indicate that few men have been so perfectly prepared for the life of a conductor. Born in Budapest on 9 August 1914, when Hungary was mobilising for the Great War – a busy time for his father Richard, the country’s leading military bandmaster – Fricsay was a typical product of the Central European melting pot, with one parent stemming from Kroměříž in Moravia, the other from Hungary. »The mother tongue of my father was still Czech,« he recalled, »but I was born a little Hungarian.« He and his father both inherited the grandfather’s tenor voice, but used it only to cajole their orchestras. Little Feri made his first attempt to conduct at four, but serious musical studies began at six with the piano, for which he went three times a week to the Liszt Academy. When he was ten Richard Fricsay, a violinist who had played under Antonín Dvořák’s baton, had the wisdom to enrol the boy in Ernst Mambrinyi’s violin class. »That was very shrewd of my father,« he recalled, »as it is indispensable for a conductor to understand the stringed instruments as much as possible, so that he can handle the strings expertly at rehearsal.« When he was 12 or 13, his father arranged for clarinet lessons; and eventually he learnt the valve trombone, timpani and percussion as well. At 13 Feri made a genuine conducting début, thrown in at the deep end in time-honoured fashion when Richard Fricsay was delayed and a weekly radio concert had to go ahead. The lad directed the entry of the guests from Tannhäuser well enough to satisfy everyone present. At the Liszt Academy, his classmates were in their 20s or even older. It was a golden age. The violinist Jenö Hubay was principal and on the staff were Ernst von Dohnányi (piano masterclass), Zoltán Kodály (composition), Béla Bartók (piano), and Leó Weiner (theory and chamber music). In his 13 years at the Academy, Fricsay studied with all of them, while taking every opportunity to observe the conductors active in Budapest: Dohnányi (in charge of the Philharmonic), Willem Mengelberg, Felix Weingartner, Bruno Walter, Erich Kleiber, Carl Schuricht, Ernest Ansermet, Wilhelm Furtwängler and Otto Klemperer. In 1930, when Arturo Toscanini was touring Europe with the New York Philharmonic-Symphony Orchestra, Fricsay assisted the great man at rehearsal. In 1933 he graduated, conducting excerpts from Die Meistersinger and his own overture Cyrano de Bergerac – he described his composition style as romantic, with a dash of Kodály thrown in. That year he was appointed military bandmaster in the major southern Hungarian city of Szeged; and in 1934, out of 57 candidates, he was chosen to head the Szeged Philharmonic. Although he sometimes chafed against the heavy workload and provincial attitudes in Szeged – in 1938 he tried to leave for Kassa (now Kosice) – Fricsay made invaluable progress in assimilating repertoire. He cut his first records, including one of his own compositions, and his Szeged Mass was performed to acclaim. In 1940 he began conducting at the Szeged Opera, with Verdi’s Rigoletto. In 1944 he moved his family to Budapest; and as peace came he left Szeged officially to become director of the State Opera, starting with La traviata. In 1946 he made his Vienna Philharmonic début and conducted the Vienna State Opera company – which had been bombed out of the Opera House – in Carmen at the Volksoper. So the man who came to international attention at the 1947 Salzburg Festival, conducting the world première of Gottfried von Einem’s opera Dantons Tod as a last-minute replacement for Klemperer, was fully ready, just turned 33 and already a master. In the 1948 festival he premièred Frank Martin’s Le vin herbé. But it was in the beleaguered East German city of Berlin, divided into zones by the former Allies and connected to the West by a narrow corridor, that Fricsay made his mark. He became acquainted with the former German capital during the fraught time in 1948-49 when the Russians were blocking off the corridor and Western air forces were airlifting 4, 700 tons of supplies to its citizens every day. Fricsay flew into the city for a series of engagements: on 3 November a radio concert at the old Funkhaus, in the British sector but used by the Soviet-controlled Berliner Rundfunk; on 18 November a new production of Verdi’s Don Carlos at the Städtische Oper, with Dietrich Fischer-Dieskau as Posa; on 12 December a concert at the Titania-Palast cinema with the RIAS Symphony Orchestra from the American sector; and on 15 December his Berlin Philharmonic début at the Titania-Palast. His success led to his being snapped up as general music director of the Städtische Oper and chief conductor of the RIAS SO, where his music director was the redoubtable Prof. Elsa Schiller. Both of them were to be inextricably linked with DGG, Fricsay as inspirational house conductor, Schiller as imaginative chief producer from 1952 to 1963. Fricsay’s first DGG sessions, in September 1949, were devoted to Tchaikovsky’s Fifth Symphony, recorded on tape but issued on the firm’s new ›variable groove‹ discs, which doubled the playing time of a 78rpm side. From 1951 his performances were released on LPs; and in 1957 he began making stereophonic records, including most of Beethoven’s odd-numbered symphonies and my Dvořák New World with the Berlin Philharmonic. His stereo productions, and many other plans, were curtailed by the cruel illness to which he succumbed in Basel on 20 February 1963. Perhaps more than any other member of the post-war generation of conductors, Ferenc Fricsay hit the world of music like a guided missile. Physically slim as a whippet, he cultivated a lean string sound from his orchestras and coaxed the music from them with extraordinary intensity. For those of us who never saw him conduct, some film footage and the many images collected by Friedrich Herzfeld for a 1964 memorial volume must do. They show an animated, often clearly inspired and spiritually charged maestro who, above all, seems always to be listening intently. Two unusually mobile hands with eloquent, expressive fingers deliver his more minute indications – he dispensed with a baton quite early on. Much of his studio work was done with the RIAS ensemble, which he headed until 1954 – twice taking it on tour – and again in 1959-63, under its new name Radio SO of Berlin. Although he had an international career, one senses that he always returned gratefully to his RIAS friends. With these players he could rehearse exhaustively: as radio musicians, they were well used to microphones and were capable of performing at their best, even in the sterile studio environment. 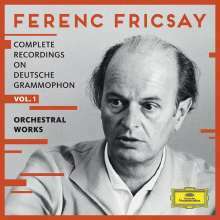 Fricsay obtained a wonderful range of dynamics from them, with the subtlest articulation, and he carried these traits over into his encounters with the Berlin Philharmonic and the Viennese orchestras. Not everyone welcomed his approach. When he conducted Le nozze di Figaro at Edinburgh in 1950 with the Glyndebourne company and Beecham’s orchestra, some players reacted with dismay. But Fricsay had history on his side: his style, so much simpler than Sir Thomas’s fussy way with Mozart, now seems prophetic of the period-instrument era. There is much model Mozart here, including interesting duplicates of Symphonies 29 and 41 and piano concertos with the unforgettable Clara Haskil – even she, relentlessly self-critical, liked her records with Fricsay. Recently, in a BBC Radio 3 ›Building a Library‹ feature on Haydn’s Trauer Symphony, the early music expert Sir Nicholas Kenyon pointed out that while the edition used by Fricsay in 1953 has been superseded, the conductor’s reading of the Adagio ›flows beautifully‹. Five other Haydn symphonies are here, full of wit and fascinating counterpoint. Fricsay’s 1953 account of Beethoven’s First always seems ideal to me – imposing enough, especially in the introductions to the outer movements, to announce a new symphonic voice, but sufficiently light and buoyant to suit a work poised at the intersection between two momentous musical centuries. The mature Beethoven symphonies are vital and magisterial by turns. Above all, Fricsay was a rhythmic conductor, who could make the orchestra dance, whether in Johann Strauss waltzes, Rossini overtures or ballets by Tchaikovsky, Gounod, Bizet, Verdi and Ponchielli. Such music was polished in rehearsal until it sparkled, then revivified in performance. Tchaikovsky’s symphonies, which often aspire to the dance, have true Slavic intensity and thrilling climaxes; but perhaps most amazing is the live performance with Yehudi Menuhin of the Violin Concerto, a rare piece with this violinist and among the earliest documents here. Together Fricsay and Menuhin plumb depths in the Canzonetta that other artists hardly hint at. The standard scores of Schubert, Schumann, Brahms and Richard Strauss had many champions in the 1950s, not least on ›the yellow label‹, so Fricsay was not often asked to take them on. When he was given the chance, however, he came up with satisfyingly ›central‹ interpretations. Besides two versions of the New World, Czech music is represented by Smetana’s Má Vlast, a separate »Vltava« and a Stuttgart radio studio rehearsal of »Vltava« from 1960, when Fricsay was already weakened by two operations although his spirit was undimmed. Four discs of Bartók represent one of the most potent interactions of a conductor with this composer. Still considered ›difficult‹ at the start of the 1950s, Bartók’s music miraculously became transparent and easy to absorb when Fricsay touched it. With textures beautifully terraced and clarified, and rhythms subtly inflected, these performances are among the treasures of the gramophone. If a few of the recordings, such as the Violin Concerto with Tibor Varga or the Dance Suite, now qualify as ›historic‹, others such as the Piano Concertos with Geza Anda come up fresh as paint every time they are reissued. Kodály’s popular dances, Háry János Suite and C major Symphony also gain from the attention of a true believer and disciple. Have they ever been better performed? The scores of Prokofiev, Hindemith, Hartmann, Blacher, Einem, Egk, Martin and other moderns are given scrupulous preparation, animated rhythmically and imbued with the inner glow that emanated naturally from this great conductor. Stravinsky is represented not just by The Rite of Spring and Petrushka, but by less well-known pieces including the Tchaikovsky arrangement The Fairy’s Kiss. Finally, apart from Haskil, Anda, Menuhin and Varga, mention must be made of the other highly individual soloists who were supported by Fricsay in setting down some of their best studio interpretations: the violinists Erica Morini, Johanna Martzy and Wolfgang Schneiderhan, the cellists Janos Starker and Pierre Fournier, the liquid-toned clarinettist Heinrich Geuser, the elegant harpist Nicanor Zabaleta and the pianists Margrit Weber, Monique Haas, Annie Fischer and Gerty Herzog. Symphony No.1 in D, Op.25 "Classical Symphony"
3. Sinfonie h-Moll, Op. 42 "Ilja Muromez"
Symphony No.100 in G Major, Hob.I:100 - "Military"
Symphony No.35 in D, K.385 "Haffner"
Symphony No.1 in B flat, Op.38 - "Spring"
Divertimento from "Baiser de la fée"
Symphony No.6 In B Minor, Op.74 -"Pathétique"